Would you rather your team to be working on projects - focus on one thing at a time until it's done, or for each person to have their own, assigned role, doing their thing at their own pace for specific goals? - let's take a look at their different aspects. Team members from different departments are gathered to all work on a project, under one project coordinator, with designated funding and often decision making autonomy. The project participants are mostly, but not always, required to cooperate directly. More often than not, the project manager will be the only superior the team will have to report to, making management easier and response time shorter. The focus and priority are one and one only: completing the project. This is a great position, from a stakeholder’s point of view. Keeps the team focus aligned as well, motivation is easier to obtain and the goal is shared. As all communication and decision making happens within a project team - things tend to be happening quite fast and fairly efficiently. As more projects are started, more teams are required, and some of their efforts will be duplicated, unfortunately making scalable economy unachievable. There is potential danger in the project team putting their project first (as they would) as far as to not seeing beyond, which can lead to a separation of teams within an organization. Projects become unattached from the "big picture". Running a company on project-basis can create an insecure environment for the personnel, as each project's end is often associated with end of work for them. This is not ideal for team morale. Long-term teams or departments cooperate on progressing tasks specific to them only. Direct communication is needed to make daily updates and arrangements - this can sometimes take some time, as each department has its own focus and priorities. Great flexibility with regards to use of the personnel - team members can work on a few projects at a time, making the best use of their time, self-managing the workload and prioritizing accordingly. With team-based organization, when an employee leaves the company, it's easier to retrace their steps and process to fill in the replacement employee. This is not quite as well facilitated in project-based organizations. The career path for the team members is quite clear and reassuring. A significant disadvantage of this type of organization lies in different priorities and levels of interest and motivation, that members of specific departments will have for a project, that they all take part in. This can result is delays in getting projects done, due to lack of focus. Finally - it can be difficult to coordinate projects run cooperatively by many separate departments, as hardly ever will this project's manager be superior to all members involved. 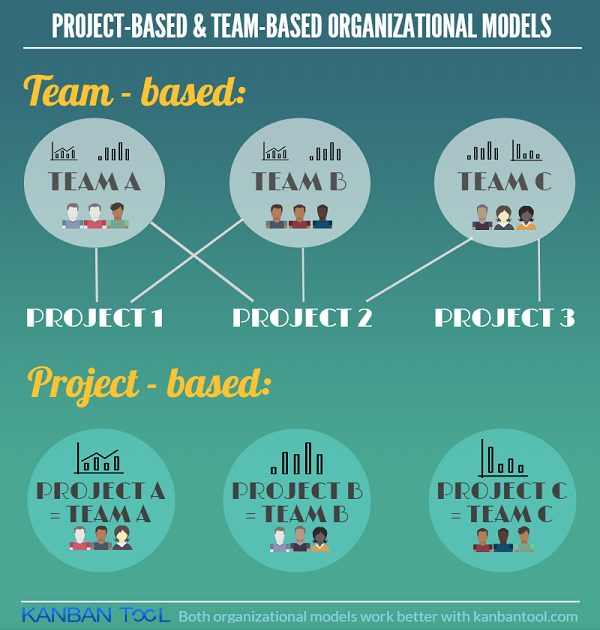 Both team-based and project based projects can create isolated groups of people or of focus within a company. The less likely to be doing this are the project-based ones, as long as there is a shift in chosen employees for different projects. But thinking of efficiency alone, it would certainly seem as though the project-based organizations get results more quickly, question is: at what cost? Of course, choosing one or the other organizational method will depend very much on the type of work an organization does and on long-term company vision. Perhaps a good compromise is running a hybrid of the two? Applying a hierarchical structure to the workforce is a good way of making everyone aware of their position, while keeping projects with their designated managers as a form of activity, not organization, should speed the completion times up. Given that the organizational roles are kept within the projects, there is a chance of killing two birds with one stone. It's certainly helpful in terms of not being able to turn attention and focus away from project to company goals. A great way of keeping goals clear and the big picture available for all on the team is using visual task management, which references other projects and keeps the organization Agile and aware of the long-term plans. Deciding on the right management model is not an issue for small to medium companies, but it is a crucial decision for any large organization. Worth giving a lot of consideration.